To view the Point Parameters form, choose “Point Calculation Parameters” from the Setup menu and select the Player\Team vs Field tab. This allows you to award points where each player\team is playing against every other player\team in the league. Example: Your league has 6 players and you are awarding 2 points for each player beat and 1 point for a tie. 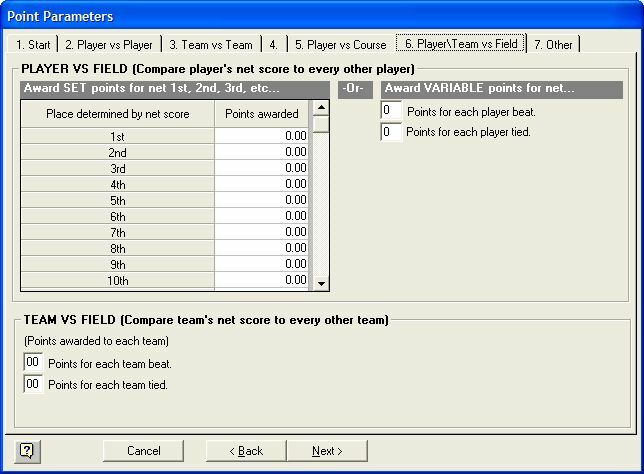 You can also set the number of low net scores to use to determine team net totals. Example: Your league has 6 teams with 10 players per team and you are awarding 2 points for each team beat.